HEAR ELLA, STUFF, and BEN in 1937! 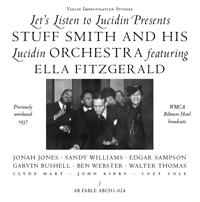 Ella Fitzgerald, Stuff Smith, and Ben Webster recorded together in the late Fifties for a Norman Granz project — “Ella Sings The Duke Ellington Songbook.” But they had been captured on disc twenty years before in what are much more fascinating circumstances. The good news is that the CD that is so delighting me is available and intensely rewarding — musically, not simply for its rarity. Anticipation over a long period rarely pays off. If you wait twenty years for something to appear, often the results, however fine, may not seem worth the wait. Not in this case. I first heard an I GOT RHYTHM by a related unit — Teddy Wilson, Jonah Jones, Ben, Lawrence Lucie, John Kirby, Cozy Cole — in the late Seventies, and learned that much more material from these sources existed. But LET’S LISTEN TO LUCIDIN (AB Fable ABCD I-024) is even more unusual. Barnett’s detailed and witty liner notes tell the story better than I could, but the Lucidin eye-lotion company decided to present fifteen-minute broadcasts (three times weekly) over New York’s WMCA featuring an all-star band of Black musicians. The singer was a young Ella Fitzgerald in pearly, playful form. Some of my readers found my comments about Ella in an earlier blogpost positively blasphemous — but this Ella I could listen to forever: girlish, earnest, sweet, tenderly improvising. One of the great pleasures of this CD is in hearing a band that didn’t record elsewhere splendid hot soloists. And the CD presents a goodly number of solos by the young Ben Webster, in top form — not yet the player who would spark the 1940 Ellington organization, but a fine, emotive player nonetheless. The selections (including “trailer” or “teaser” incomplete versions of tunes that would be played the next week) include jazz standards: STOMPIN’ AT THE SAVOY, I GOT RHYTHM, THE WORLD IS WAITING FOR THE SUNRISE, STARDUST, I FOUND A NEW BABY, SHINE, BASIN STREET BLUES, and HONEYSUCKLE ROSE. But the current pop hits are also covered: Ella is touching on CHAPEL IN THE MOONLIGHT and GOODNIGHT MY LOVE, sweetly energetic on COPPER-COLORED GAL. Cozy Cole and John Kirby are properly supportive; the under-recorded Clyde Hart is just fine. For my taste, there isn’t enough Stuff, but he has some features and offers a lovely obbligato to Ella’s vocal on GOODNIGHT MY LOVE. His feature on CLOUDS is a treat. And IT’S DE-LOVELY, split between Ella and Ben, is a gem. This music comes from radio broadcasts, another delight. Jazz collectors know the Ellington Victors, the Basie Deccas, but they are finite. To find new “live” material from the Swing Era is always a great gift, especially because thousands of hours of music were broadcast between the early Thirties to the end of World War Two. We have only the smallest portion, and certain orchestras and players were not well-documented. This CD is also an anthropological trove of Thirties pop culture, sometimes unintentionally hilarious — because Barnett has wisely kept in all the announcements, commercial and musical. By the time this disc was finished, I was eager to buy Lucidin: I would have been a loyal consumer! The commercials are truly amusing, because announcer Don Kerr was required to promote a product not yet available. But even better, the Lucidin people were unhappy with the frequency and length of their competitors’ commercials. So Kerr tells us frequently that the company finds such announcements boring and painful, and won’t do them. Some of Kerr’s disquisitions do go on, but neither he or Lucidin seems to have been indulging in subversive ironies. A few tracks have unavoidable surface noise, but only the most finicky listeners will reject the opportunity to hear these players in new performances. It’s a delightful disc throughout, one of those rare CDs I can listen to all the way through at one sitting. It offers not just Ella, Stuff, and Ben, but what a now-vanished population heard on WMCA. And Barnett’s meticulous research is a real pleasure: the liner is illustrated with rare photographs and drawings. It was worth the wait! It can be ordered through the AB Fable website: www.abar.net.